How to «open» microchip and what's inside? Microchips - are indeed can be considered a black box - as long as it's working you normally don't look inside. Today we'll show how to "open" chips and what's inside. 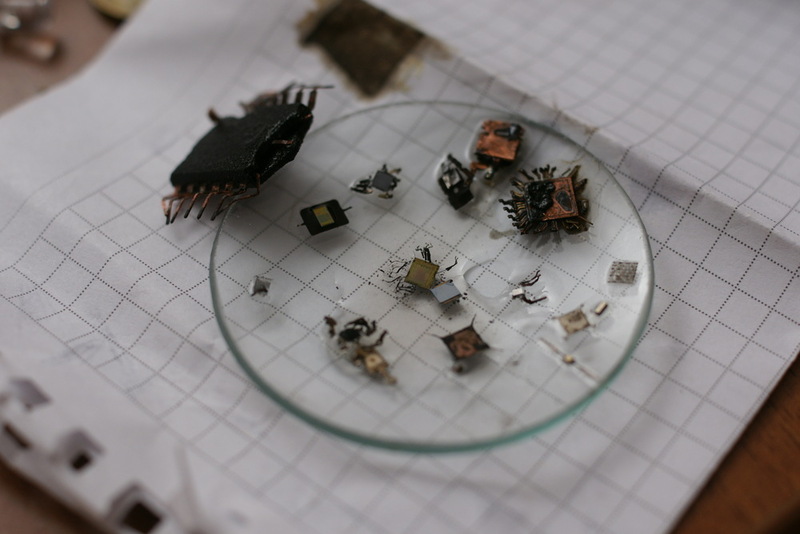 Take some microchips of interest and add concentrated sulfuric acid. 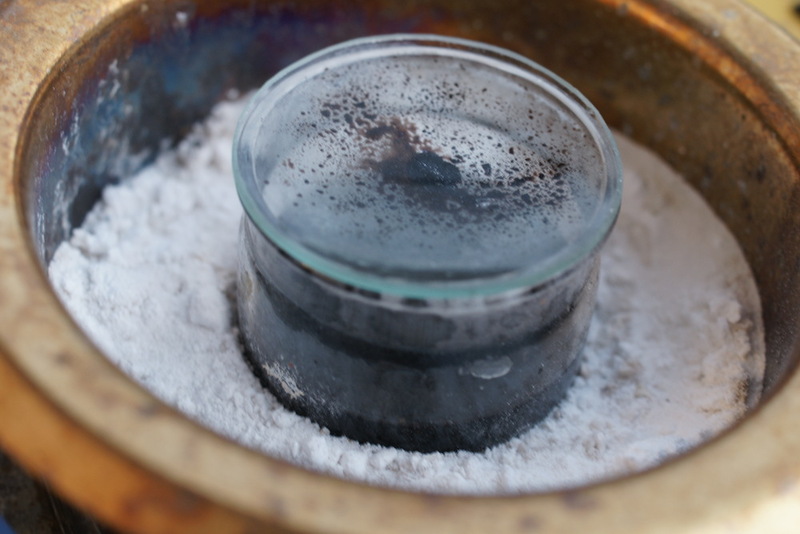 Container should be closed, but not airtight, so that fumes can escape (that is extremely important). Heat it to boiling temperature (300 °C). White substance at the bottom is baking soda - it's here to neutralize accidental spills and part of fumes. Images are clickable (beware of 5-25Mb JPEG's). Colors are enhanced, in reality they are much less saturated. 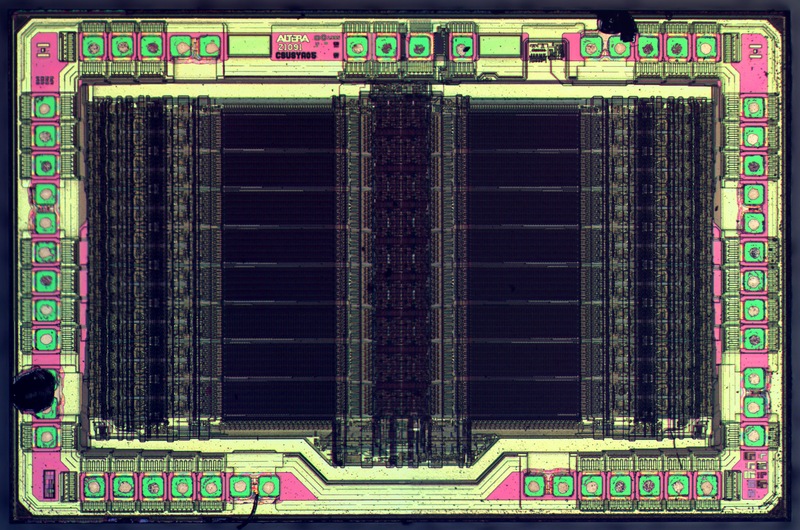 NXP 74AHC00 — quad 2-input NAND gate. 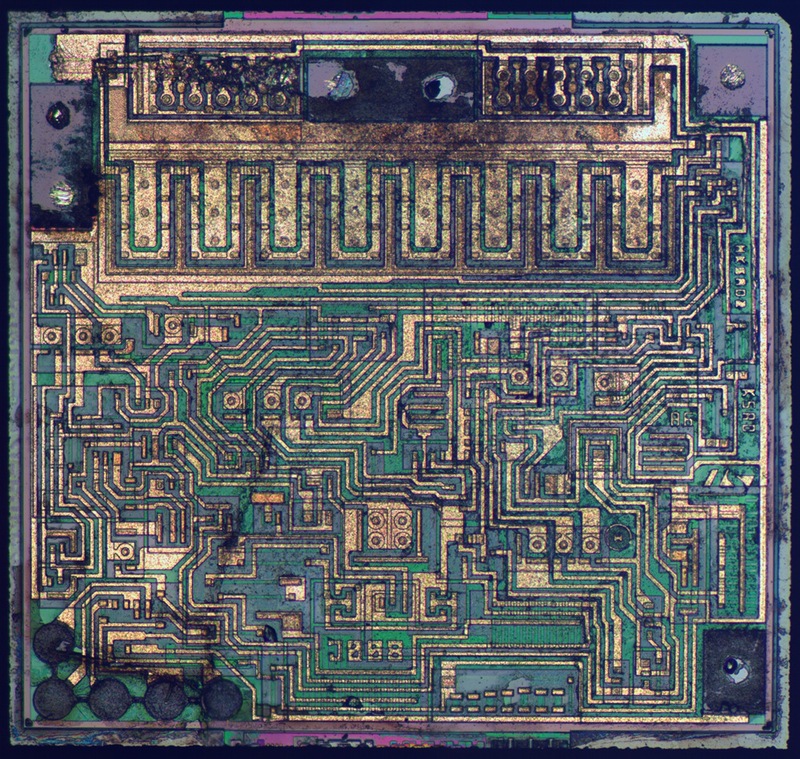 This is a nice example that 'old' tech nodes (1µm and older) are still in use. 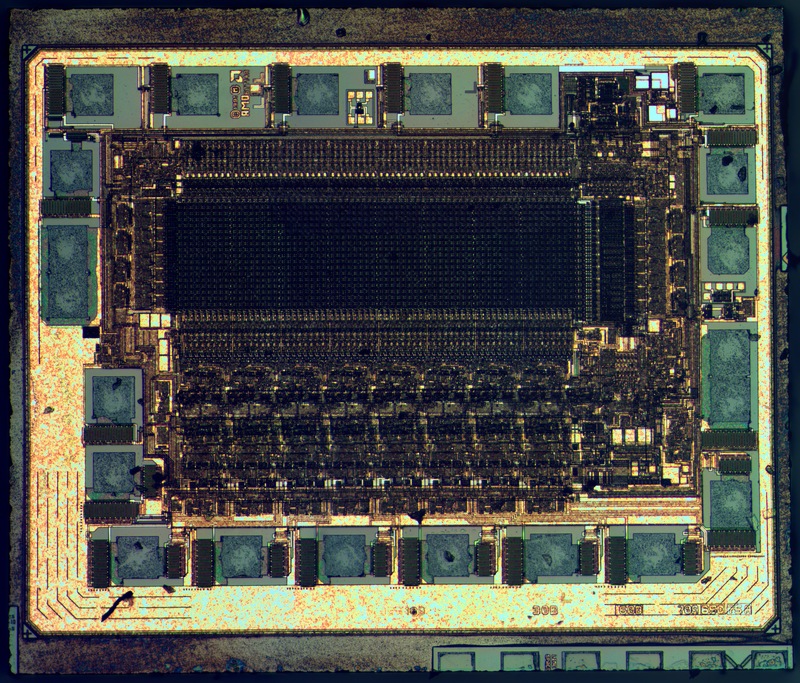 Also, note how many spare via are there for improved yield..
Micron MT4C1024 — 1 mebibit (220 bit) dynamic ram. Widely used in 286 and 386-era computers, early 90's. 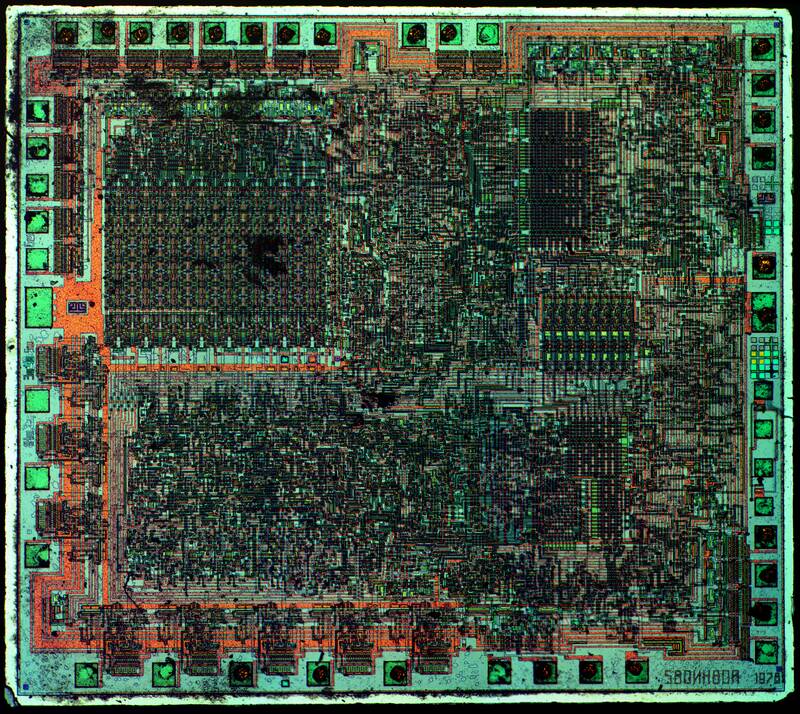 AMD Palce16V8h GAL is an 32x64 array of AND elements. 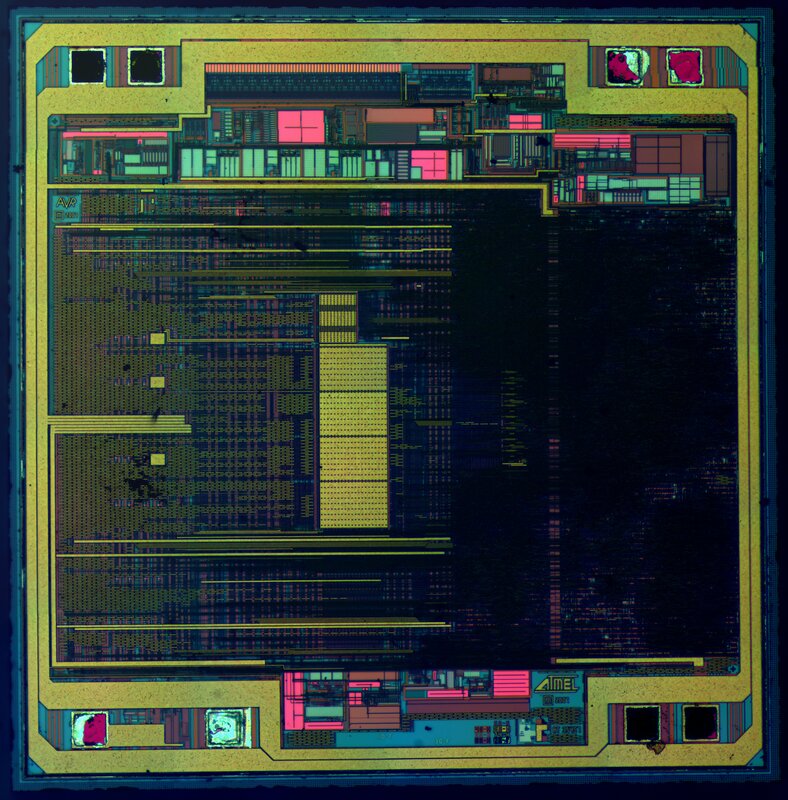 GAL(Generic array logic) microchips are FPGA and CPLD grandfathers. 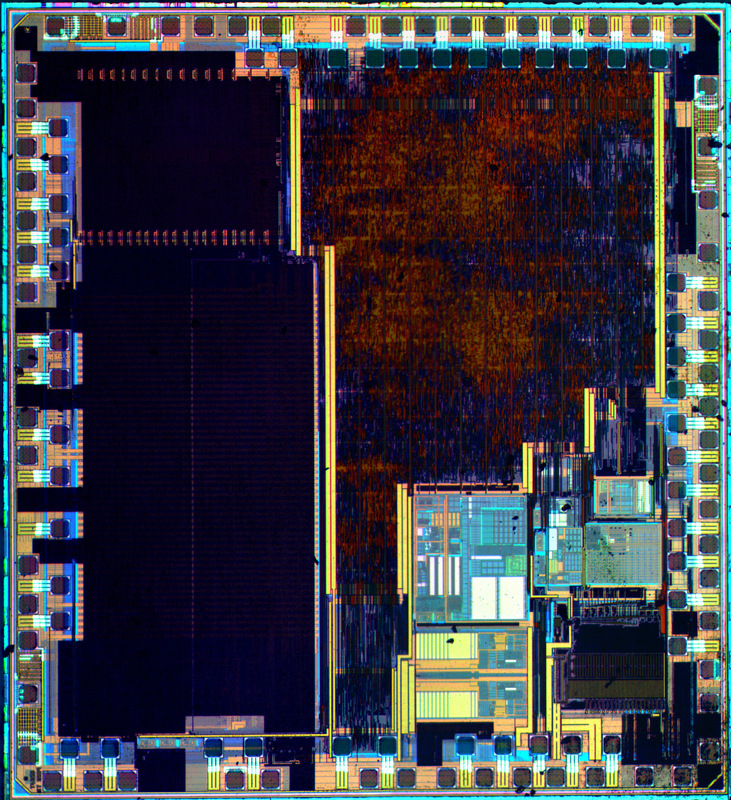 Die size - 2434x2079µm, 1µm technology. 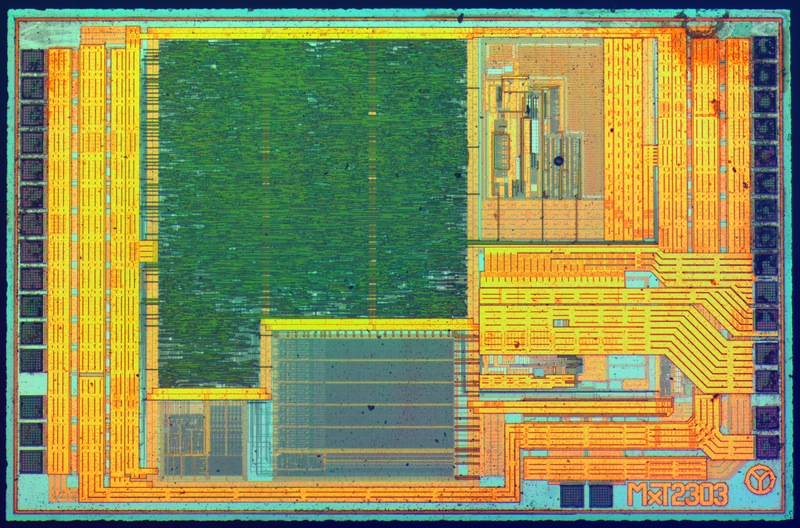 ATtiny13A — one of the smallest Atmel's microcontrollers: only 1kb of flash and 32 bytes of SRAM. Die size though appeared to be unexpectedly big (1620x1640 µm). ATmega8 — one of the most popular 8-bit microcontrollers. Die size - 2855x2795µm, technology node 500nm. 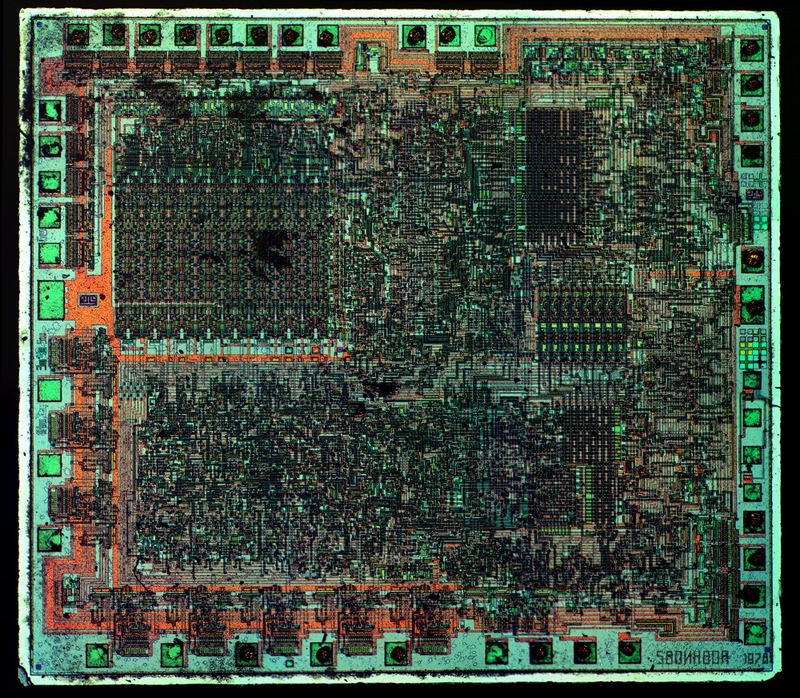 KR580IK80A (later renamed to KR580VM80A) - one of the most widespread soviet processors. 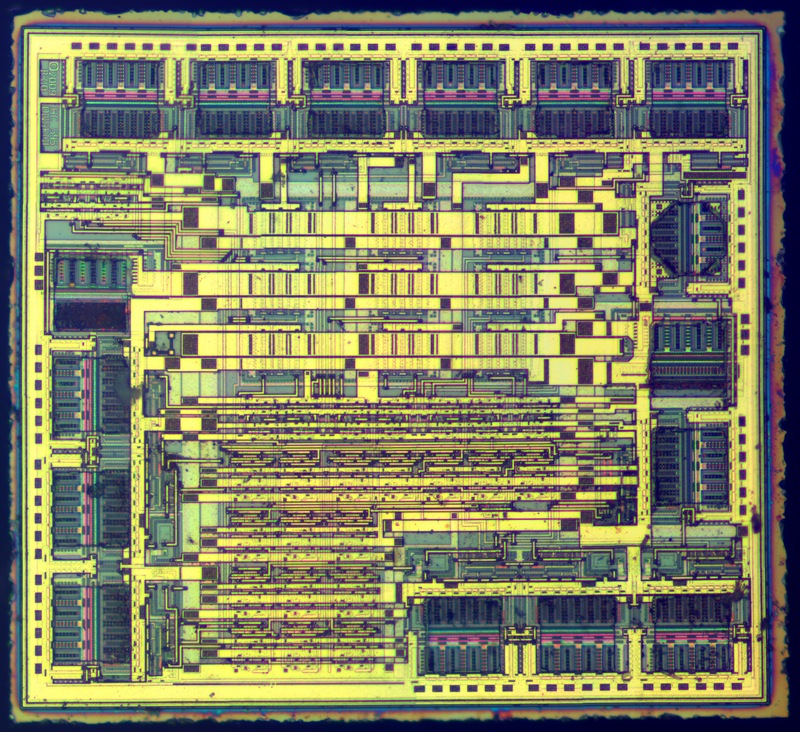 Contrary to popular belief, it appeared to be not an Intel 8080A (or 8080) clone, but a code-compatible redesign (while several parts are quite similar, routing is different as well as pad placement). 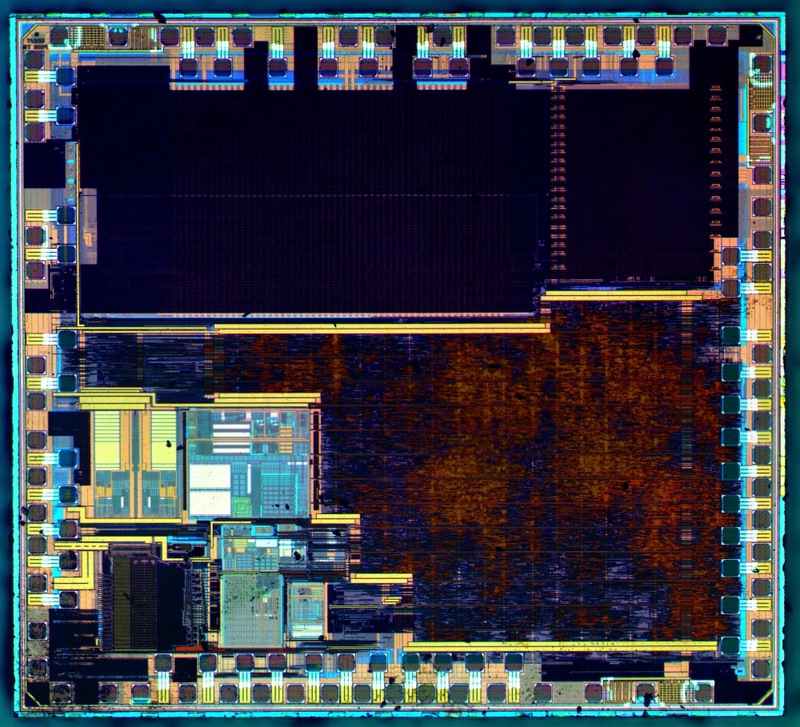 STM32F100C4T6B — is the smallest microcontroller made by STMicroelectronics based on ARM Cortex-M3 core. 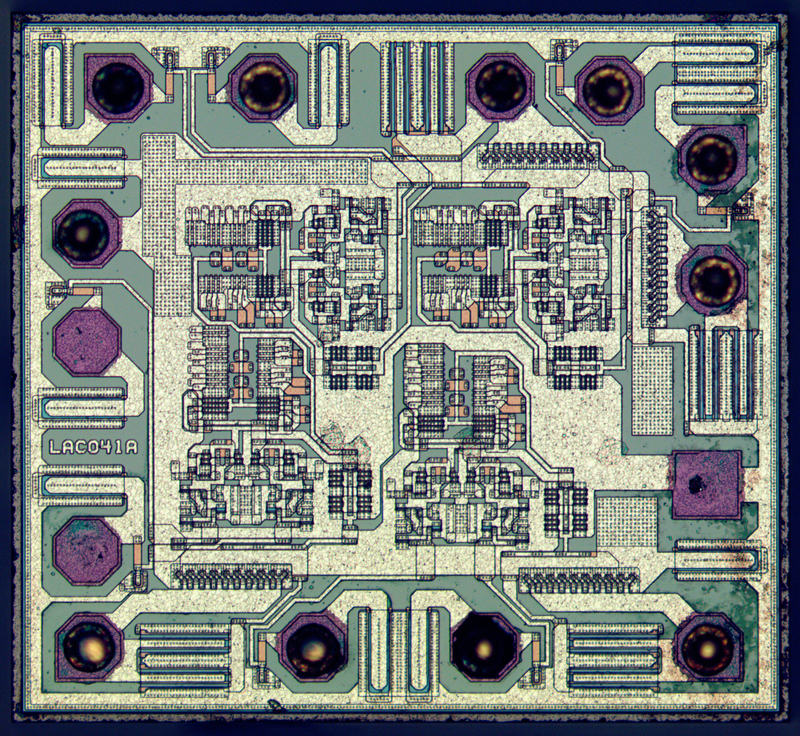 Altera EPM7032 — Altera EPM7032 - CPLD that have seen a lot... One of the last using 5V supply. Die size - 3446x2252µm, technology node 1µm. MIFARE chip, used in Moscow's subway RFID tickets. 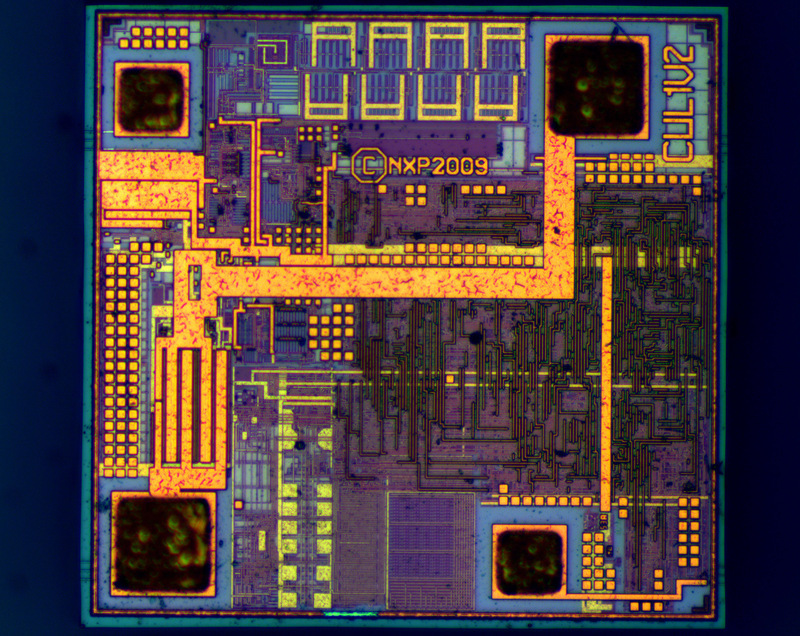 Die size - 640x620 µm. Follow us on Twitter @Zeptobars or subscribe to our RSS feed - we'll continue opening chips. 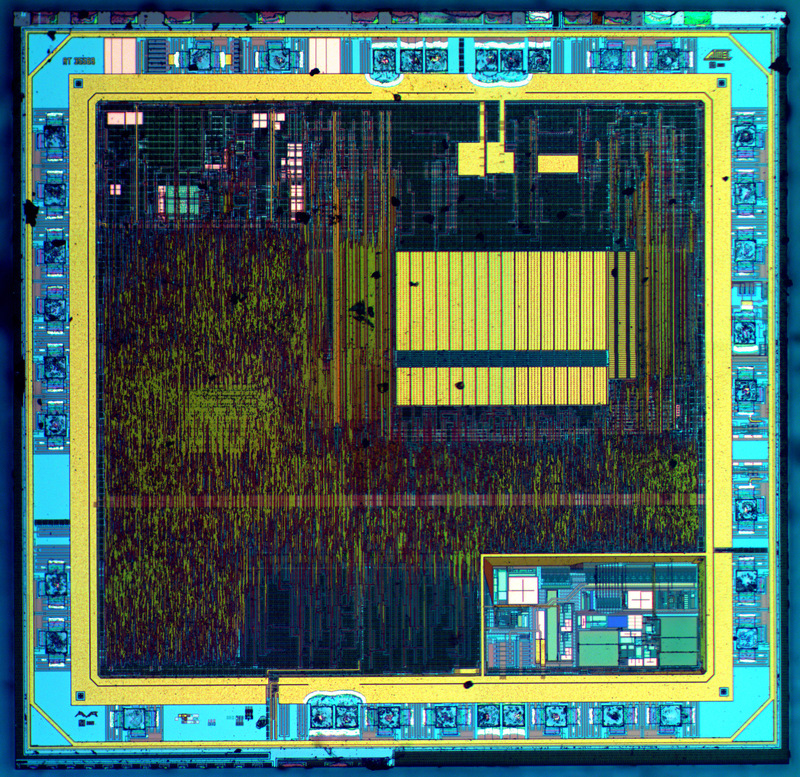 See Part II: How to «open» microchip and what's inside? Z80, Multiclet, MSP430, PIC and more. Update: Wow, time flies, It's been 7 years! Just a quick update - since that time I started to decap chips in much smaller acid volume (~0.2-1ml per chip) in test tubes, which is safer. 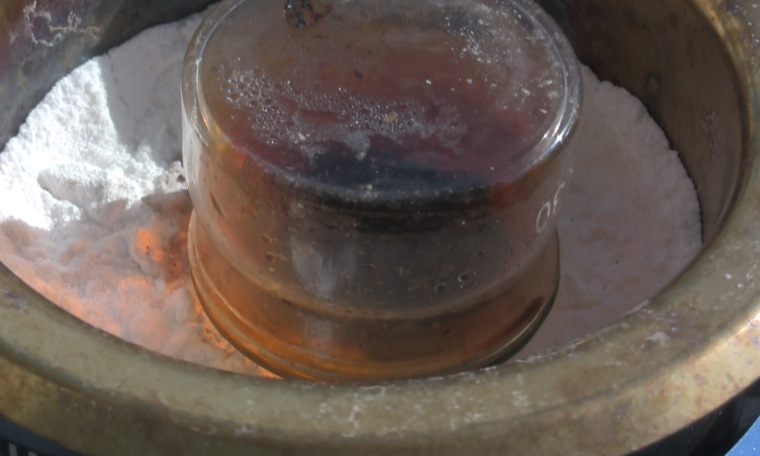 Cleaning in nitric acid is no longer used to reduce process complexity. When needed - I just repeat sulfuric acid etch in test tube. 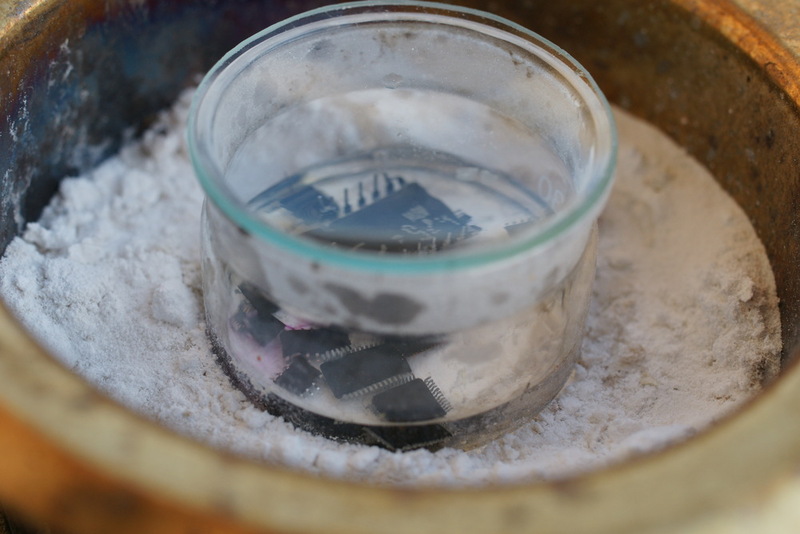 Large etches also make use of chemical fumes neutralization in baking soda solution. Always wear eye protection and gloves! Remember that regular lab gloves self-ignite in fuming nitric acid. You can also now support us at Patreon.